Do we want another supermarket in Marple? What about pedestrian access across Stockport Road and traffic in general? Are we doing enough to promote tourism to our area via our industrial heritage? Do we want to change the leisure and other amenities in Marple, and how? Should we prioritise the opportunities for community hubs around our two stations? What should we do about Goyt Mill and what are our options for residential or industrial use? The draft Marple Neighbourhood Plan is available to read via this link. Please take the time to read the plan, then complete the survey and submit your comments. 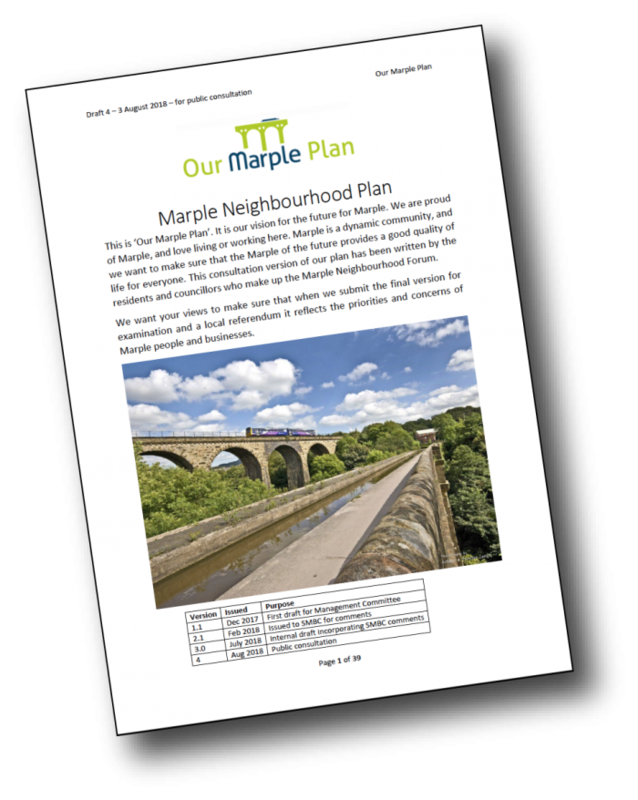 The on-line Marple Neighbourhood Plan survey is available via this link. You can also respond to the consultation in the Red Letterbox located in Marple Library. Marple Neighbourhood Forum will hold their third Annual General Meeting at 10 a.m. on Saturday 15th September at the United Reformed Church on Hibbert Lane. Here is an Agenda Pack for the meeting. As well as the Agenda, this includes a Nomination Form, 2017 AGM Minutes and Treasurer's Report and Accounts for 2018. Forum members are invited to raise issues under Item 6 'Other Relevant Business' and should inform the Secretary in writing of their wish to do so by 31 August 2018 latest. Also attached is a nomination form for management committee membership. The MNF would very much welcome additional members, particularly from the under-50 age groups, as they finalise plans and policies and begin the process of implementation. Experience of Planning isn't necessary; a passion for the future of Marple is all you need to contribute. If you would like to be nominated please complete the nomination form and return to the Secretary by September 5th. The meeting will be followed by a roundtable discussion on some of the key elements of the current draft. We very much hope you will be able to join us for what we anticipate will be another engaging and valuable session.